Working the best job I've ever had in my whole life, I'm still-- I mean, I am a breath away from drowning. I'm $20 away from being on the street. I am one car payment away from being re-po'ed. I'm barely surviving. I'm leading a substandard lifestyle because I make substandard wages. Quetel's union, AFSCME, has been negotiating a new contract with the University of California system for ten months. In late May, AFSCME scheduled a strike for 20,000 health technicians and clerical workers for June 4th and 5th. The university filed a restraining order with the Public Employee Relations Board to halt the strikes on May 28, 2008, claiming union members were vital to delivering medical care. But the union cancelled the strike May 30, before the board could issue a ruling. The two sides released a joint press-release on May 29, 2008, announcing a return to the bargaining table. Recently, the protracted negotiations caused an additional complication for schools in the UC system: several high-profile commencement speakers, including former President Bill Clinton, have declined their invitations. 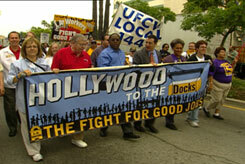 Hundreds of union members from several unions marched twenty-eight miles in a march organized by the Los Angeles County Federation of Labor called the FIGHT FOR GOOD JOBS. You can view pictures from rallies along the march by clicking on the markers in the map below. Published on June 13, 2008. The California Nurses Association proposes "CheneyCare" for what ails America. The President of Service Employees International Union, the fastest growing union in the nation, weighs in on the growing economic gap between average families and the wealthiest Americans. Official Web site for the march. A paper by the Economic Roundtable. Briefing paper about the march. "UC reaffirms commitment to employees, patients and students despite potential strike by union"
Press release from the University of California. "UC asks for order to stop AFSCME strike"
by Kathy Robertson for the SACREMENTO BUSINESS JOURNAL, May 28, 2008. "UC workers call off strike" by J.M. Brown for the MERCURY NEWS, May 30, 2008. Announcing return to bargaining table. "UCSC commencement speakers bow out, citing union battle" by J.M. Brown, for the MERCURY NEWS, June 10, 2008. "Labor dispute prompts Bill Clinton to cancel UCLA speech" By Rong-Gong Lin II, for the LOS ANGELES TIMES, June 11, 2008. Bill Moyers Journal analyzes the growing inequality gap on the ground in Los Angeles where recently union workers marched to bring attention to how they are getting squeezed out of the shrinking middle class. Follow the march with our virtual map. Steve Fraser, historian and author of WALL STREET: AMERICA'S DREAM PALACE, discusses the modern parallels and differences to the first Gilded Age, the big disparity between the rich and poor, and the increasing strain on working Americans. Holly Sklar, co-author of RAISE THE FLOOR: WAGES AND POLICIES THAT WORK FOR ALL OF US, discusses what current economic conditions say about the state of the American dream.